simply by physically obscuring your hand when entering your PIN. Here at Techlicious, we’ve discussed how important it is to check ATMs, gas station card readers and even post office stamp kiosks for card skimmers. The tiny theft-enabling devices are everywhere, and, according to the security experts at the European ATM Security team, they’re getting much harder to find. Thieves are now experimenting with a new type of wiretapping device that can steal your account numbers without needing access to your card’s magnetic stripe at all. Brian Krebs explained the details of how the new device works on his blog Krebs on Security. Criminals drill a small hole into the front of an ATM machine where the “insert card” decal is located. They then feed a wire into the machine using a metal rod to tap the ATM’s existing card reader. A new decal is then pasted over the hole, making the crime incredibly difficult to detect. Another new type of device called the “insert transmit skimmer” is also gaining favor among thieves. It’s made up of two small steel plates and fits directly in an ATM card reader. The tiny device reads debit cards and transmits the stolen information to a nearby receiving device, usually about 1 meter away. Like traditional skimmers, both of these new devices require a hidden camera for thieves to steal your PIN. Krebs warns that thieves are increasingly hiding cams in fake sidebar panels. Cameras have even been discovered hiding in fake bank brochure holders, so be sure to keep an eye out for anything that looks unusual, altered or suspicious. 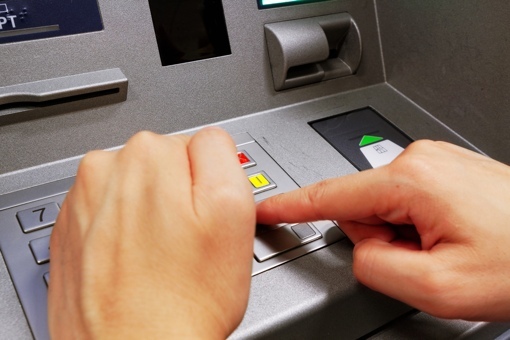 And always obscure your hand when using an ATM or other card reader that requires a PIN, even if no other humans are around – it’s good security practice and an effective defense against these skimmer and tapping attacks. Took a couple of paper clamps/clips and some heavy duty tin foil shaped into a half dome, wide enough and tall enough to get my hand in. Clips on the front edges help it sit where needed. Set it down on the keyboard of the atm or clip it to the vertical ones. The foil is fook alexible enough to reshape as needed & it cost only pennies to make.